SellUsYourStory.com provides a free service to help people share their amazing real-life stories with the national press and get paid the highest fee possible. 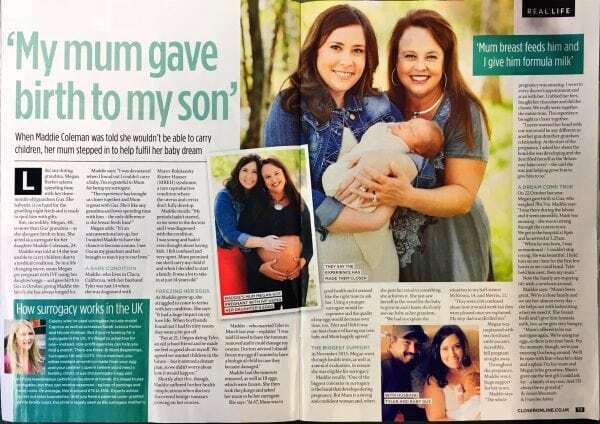 This week we helped Maddie Barker tell the incredible story: My mum gave birth to my baby. Like any doting grandma, Megan Barker adores spending time with her grandson Gus. She helps out with babysitting and happily does the night feeds. 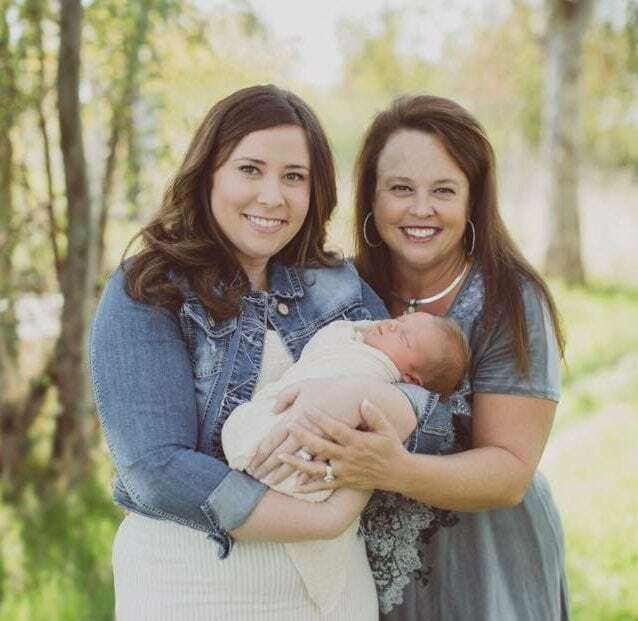 But incredibly, Megan, 48, is more than Gus’ grandma, she also gave birth to him after acting as a surrogate for her daughter Maddie Coleman, 24. Maddie was told at 14 she was unable to carry children due to a medical condition. So her mum kindly offered to help and gave birth to Gus in October last year (2016) after going through IVF using Maddie’s eggs. Now thanks to her mum, Maddie, has the family she’s always longed for. Maddie, who lives in Chico, California with her fiancé Tyler, AGE, was just 14 when she was diagnosed with Mayer Rokitansky Küster Hauser Syndrome, a rare reproductive condition where the uterus and cervix don’t fully develop. Maddie recalls: “My periods hadn’t started so we went to the doctors and I was diagnosed with the condition. I was so young I hadn’t even thought about having kids, I felt confused and upset. As Maddie grew up she struggled to come to terms with her condition. She explains: “It had a huge impact on my love life. When boyfriends found out I had problems with my reproductive system they were a bit put off. “But I met Tyler, an old school friend, aged 21 and he made me feel so good about myself. “When Tyler and I talked about our future and having children we knew we wanted them we just didn’t know how. Sadly, shortly afterwards, Maddie suffered further health complications when doctors discovered benign tumours were growing on her ovaries. She explains: “I was told I’d need to have the tumours removed and this might damage my ovaries. Doctors advised I should freeze my eggs if I wanted to have a biological child. “My husband and I thought about adoption but the opportunity for surrogacy felt right. Especially since we found out my ovaries produced eggs, with my MRKH I didn’t even know if that was possible! Maddie then made the decision to freeze her eggs and decided it was time to ask her mum to be her surrogate. She explains: “We decided to do surrogacy with my mom right away because the timing was right for her. In November 2015 Megan went through tests to ensure she was eligible for surrogacy. The vigorous testing included a physical, blood work, ultrasounds and X-rays. Megan also had a mental evaluation to ensure she was emotionally capable of going through the pregnancy and giving the baby over to us. A major concern for families going through surrogacy is the bond that develops during pregnancy but this was never a concern for Maddie. She explains: “Mum is a such a confident and strong woman. When she sets her mind to achieve something she is never misdirected. “In the beginning of the pregnancy I raised the same concerns. She responded by saying she is the deluxe easy bake oven, just helping grow him to give him to us. In October last year Maddie gave birth to Gus, weighing 7lb 7oz. Maddie said: “Labour and delivery went fast. We arrived at the hospital at eight in the evening and she was so strong through contractions. “She never screamed or cried she just breathed through it all. She pushed for 15 to 20 minutes and our son was born at 3:25am on October 22nd. “He was so beautiful. Everyone in the room was crying happy tears of joy. I was relieved that all of our hard work and love put in to this adventure had finally paid off. Now the family are adjusting to their newborn, with the help of Maddie. Megan says: “Mum’s been great. I was the first person to hold Gus – I held him for about 3 hours on my chest and we immediately bonded. “My mum is definitely grandma with the exception of her pumping breast milk so we could bottle feed him. “I think it is an amazing gift that my mom has the ability to provide breast milk for our son. We think it is so amazing and healthy for him! If you have an amazing story to share, simply get in touch and we’ll help you get the highest amount of cash for your story. Our service is completely free. The best way to reach our features team is to fill out the story valuation form on this page. You can find out more about how to sell a story to the press here, or you’ll find other ways of contacting the press here. Our sell my story page will tell you everything about the story selling process.